Magic Red is 100 % animal complete organic matter, heated under saturated steam conditions to a temperature of not less than 133 ℃for a minimum of 40 minutes at an absolute pressure of 3~5 kg/cm2(cook and hydrlyzed). matching the standard of OIE. 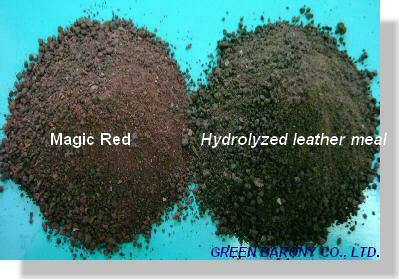 Handle to join the Magic Red package reaction in the process and dehydration in 150-170℃ 5-7kg/cm2 make into Magic Red. Steamed Leather Meal under high quality term processing becomes the 「Hydrolyzed leather meal」; Hydrolyzed leather meal under high term quality becomes the Magic Red .